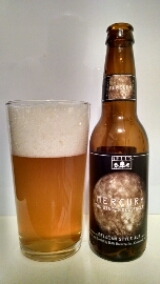 In this special beer blog, we are going to get into third brew from this Planet series from Bell’s Brewery. It is Mercury The Winged Messenger Belgian Style Ale. After a major recall, I took my chances to try this beer because of glass being in it. I filter this beer twice. I am still alive and I did not see any glass. If you read my earlier beer blog posts on their beers, you know the history of this midwest craft brewery. If you have not, please, read them to get to know this Michigan craft brewery legend. Let us get into this Belgian style ale. It has a slight cloudy golden color with a white constant head. It has a big bubbles in the head. The smell has a floral to herbal notes. The taste has an herbal to species. The aftertaste has a nice dry finish. It is pretty drinkable beer. This is one of a seven part series inspired by Gustav Holst’s musical composition. “The Planets,” strap in and embark on a flavor tour of our solar system – in the order of Holst’s piece, Mars to Neptune.